The Lorraine 39L AM is a French tier 3 self-propelled gun. Un cañón autopropulsado construido sobre la base del blindado sobre orugas Lorraine 37L. El desarrollo comenzó justo antes de la II Guerra Mundial. Solo existió en planos. 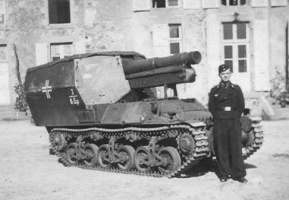 The Lorraine 39L AM has amazing gun range compared to other tier 3 self-propelled guns, both at nearly one kilometre. Both guns have very high damage and relatively low reload time. Also, the hull traverse on this tank is good for artillery, but all this comes at the price of a under powered engine and a narrow gun arc. The aim time on the Lorraine 39L AM is long, and not very accurate, and the splash damage is dreadfully low. This tank is also incredibly small, making it very hard to spot, and more importantly, very hard to hit. The Lorraine 39L AM leads to the AMX 105 AM mle. 47. 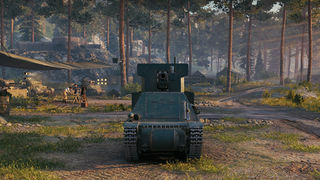 Compared with the RenaultBS, the Lorraine39 has more range and hits harder, but fires slower. It also aims slower. 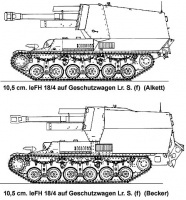 Compared with the M7 Priest and the Wespe, the damage and penetration is identical for all three, while the accuracy and rate of fire is nearly so. However, the Lorraine39 has less range in comparison (about 760 meters with stock gun, 840m for 1934S-gun), roughly on par with the SU-26. This is compensated by a slight advantage in aiming time. The second gun improves rate of fire, accuracy, and aim time, so it's a worthy purchase. The Lorraine39 is smaller than the M37, so presumably it has better camouflage values. The engines are basically a redo of the RenaultFT engines for a different vehicle. The Franklin engine had more horsepower and weighed the same. Too bad you can't use it. Fortunately the Lorraine39 isn't any heavier than its predecessor. The ER 53 radio carries over from the RenaultBS, so install it immediately. Research the Delahaye 135 engine first, it has the same weight as the stock engine. Upgrade the suspension next, then the gun and the radio. The Lorraine 37L or Tracteur de ravitaillement pour chars 1937 L, ("Tank Supply Tractor 1937 L") was a light tracked armoured vehicle developed during the Interbellum by the Lorraine company to a French Army requirement for a munitions and fuel supply carrier to be used by tank units. A prototype was built in 1937 and production started in 1939. In this period also two armoured personnel carriers and a tank destroyer project were based on its chassis. Mainly equipping the larger mechanized units of the French Infantry Arm, the type was extensively employed during the Battle of France in 1940. 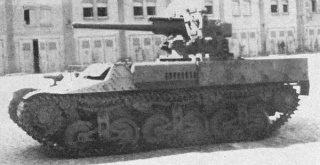 After the defeat of France, in Vichy France a clandestine manufacture was continued, culminating in a small AFV production after the liberation and bringing the total production to about 630 in 1945. 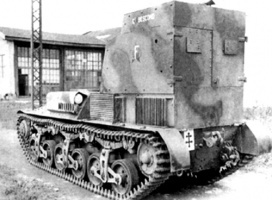 Germany used captured vehicles in their original rôle of carrier and later, finding the suspension system to be particularly reliable, rebuilt many into tank destroyers of the Marder I type or into self-propelled artillery. In 1934 the order was given to design a munitions supply vehicle to increase the operational range of independent tank units. The same year the Renault 36R was selected for further development; three hundred were ordered from 1938. 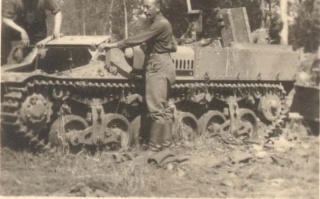 However this tractor was only partially armored; on 17 April 1936 a new set of specifications was drafted for a fully armored vehicle to deliver fuel and munitions to tanks fighting on the frontline. Early 1937 the Lorraine company finished a prototype. It was a lengthened version of a proposed replacement type for the 1931 model Renault UE Chenillette tracked infantry supply tractor. In February 1937, the materiel commission, the Commission de Vincennes, was ordered to test the prototype and to complete an evaluation before 1 November 1937, even if testing would not yet have been finished. The prototype was only presented on 9 July and tested until 4 August. Although the vehicle attained a maximum speed of 30 kilometers per hour (19 mph), this dropped to an unacceptably low 22.8 kilometers per hour (14.2 mph) when an intended fuel trailer was attached. It was therefore returned to the factory; after a stronger engine and clutch had been fitted it was again tested between 22 September and 29 October and now achieved the desired 35 kilometers per hour (22 mph). The commission approved the type late 1937, especially impressed by the rugged suspension system. It was decided in September 1939 to reserve the total production capacity of the suspension elements for the larger tractor. This implied that the shorter Lorraine replacement for the Renault UE, though also favoured over other candidates, would not be taken into production: an order of a hundred made early 1939 was that month shifted towards the longer version. In 1938 three orders were made: of 78, 100 and another 100 vehicles of the Tracteur de ravitaillement pour chars 1937 L (TRC 37L); in 1939 before the war a fourth order followed, of 100, and a fifth of 74 to which was added the replacement order of 100 for a total of 552. The first vehicle was delivered by Lorraine on 11 January 1939; 212 had been delivered on 1 September 1939. 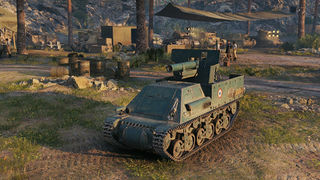 The Lorraine 37 L is a rather small vehicle, just 157 centimeters wide, showing that it was derived from a chenillette project. Extra space had been found by lengthening the chassis to 422 centimeters, making it relatively oblong. Lacking a turret or superstructure its height is also not excessive at just 1215 millimeters. The small dimensions combined with a light amour — nine millimeters for the vertical riveted plates, six for the top and bottom and twelve for the cast rounded nose section — ensured a low weight: the basic TRC 37L weighs just 5.24 metric tonnes empty, the trailer adding 1.2 tones. 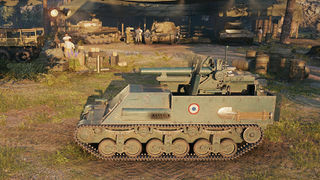 Given the vehicle's low weight, the suspension is quite robust and exceptionally reliable in comparison with other systems used on French armor of the time, that were either too complicated or too flimsy. Six large road wheels in three bogie pairs ensure a low ground pressure and good weight distribution. Each bogie is allowed a vertical movement in its entirety, sprung by an inverted leaf spring assembly located just below the upper track run, the three assemblies being placed between the four top rollers. The tracks are 22 centimeters wide. The drive sprockets are in the front and driven by a transmission in the nose of the vehicle. Two crew members, the driver on the left, can be seated in the driver compartment, the drive shaft between them. Entrance to the compartment is offered by two wide horizontal hatches, the upper hinging upwards, allowing the driver an unobstructed view if opened, the lower hinging downwards. Behind the driver compartment is the engine compartment separated by a bulkhead. On the left outside of the compartment is a silencer with an armored covering. All vehicles in the series were powered by a Delahaye Type 135 6-cylinder 3.556 litre engine developing 70 bhp (52 kW) at 2800 rpm, giving a maximum speed of 35 km/h. The wading capacity is 60 centimeters, a trench of 130 centimeters can be crossed, an incline of 50% climbed. There is a fuel supply of 144 liters, allowing for a range of 137 kilometers. At the back is an armoured bin to transport ammunition; a load of 810 kilograms can be carried bringing the weight to 6.05 tonnes. As with the Renault UE, the TRC 37L is supplied with a tracked, armored trailer with two road wheels per side, mostly used to carry a 565 litres fuel tank to supply the tank units; total load capacity is 690 kg for a total for the combination of 1.5 tonnes and a total weight of the trailer of 1890 kg. The trailer is somewhat narrower than the main vehicle, at 155 cm and higher at 133 cm. It increases the length of the combination to 690 centimeters. The trailer also carried a Vulcano fuel pump and stowage boxes for lubrication oil, greases, water and assorted equipment to serve the tank maintenance teams. In 1939 the Lorraine 37 L was gradually introduced to the supply units of the tank battalions. This coincided with a change in tactical thinking about the use of armour. In the early thirties French doctrine had favored the construction of ever deeper defensive belts to counter infantry infiltration tactics to defeat enemy attacks before they could develop into full-scale maneuver warfare, a field at which the French were painfully aware to be less adept than their most likely adversary, Germany. Expecting any possible enemy to defend himself likewise, the armour branch of the French Infantry became much preoccupied with the vexing problem of how to break through similar in-depth positions itself, emphasizing close cooperation with the foot soldier. Far less attention was paid to the next phase: the envelopment of the enemy forces. The situation changed in the late thirties. Having at last built a considerable number of modern and well-armoured tanks, the Infantry became confident in its ability to break the enemy line, if sufficient artillery and air support was provided within a combined arms tactic. At the same time the political situation made it likely that large-scale offensives were needed to bring Germany to its knees. Though few officers advocated the creation of armoured divisions able to execute both the breakthrough and the strategic exploitation phase — these required trained personnel in numbers that simply would not be available — it was understood that the "manoeuvre mass" of tanks effecting the break would immediately have to envelop the defensive enemy position and defeat counterattacking enemy armor reserves, otherwise the momentum of the attack would be lost and the breach would not be kept open long enough for the motorized divisions and Cavalry armored divisions to be launched to quickly occupy and hold strategic key positions. However, this posed a serious logistical problem: trucks would not be able to closely follow the tanks on the battlefield. The prescribed procedure for resupplying was for the tanks to return to their start positions to be refitted. While this had still been practical in the previous war with its much slower tempo of operations, it was unacceptable in modern warfare. The tanks would have to be supplied in the field to continue their advance as soon as possible. 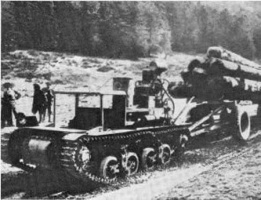 Thus a tracked supply vehicle was needed that could overcome the expected poor terrain conditions, with many shell-craters and trenches, and it had to be armored to protect against shell-fragments, given that the breakthrough sector would likely be in range of concentrated enemy artillery. The type was provided to both the armoured units of the Infantry and of the Cavalry. Each independent tank battalion of the Infantry, or Bataillon de Chars de Combat, had an organic strength of twelve Lorraine tractors: four in the peloton de reserve (supply platoon) of each of its three companies. The BCCs incorporated in the armoured divisions and equipped with the Char B1 or Char B1 bis had however 27 TRC 37Ls: each of their three companies had six tractors in its supply platoon and furthermore a single tractor organic to each of its three tank platoons. This extra allotment was made to compensate for the large fuel consumption of these heavy tanks, that, apart from being simply bigger, had also a rather limited range. Each group of three tanks was in their case thus directly followed by its own fuel supply. When during the Battle of France independent companies were formed these too had their four Lorraine tractors — or a reduced allotment of eight if a Char B1 bis unit. 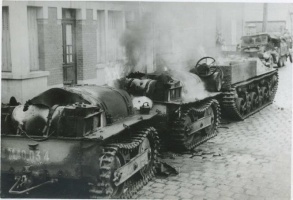 However, the older FT 17 battalions did only use fuel trucks. Likewise the TRC 37L was not in common use in the colonies; but when the 67e BCC, equipped with the Char D1, was in June brought over from Tunisia, it was yet provided with tractors. 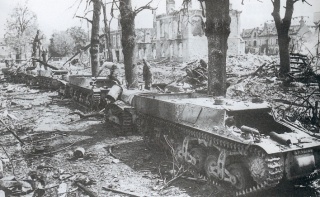 The Mechanised Infantry Divisions did not use the TRC 37L. In the Cavalry each squadron of twenty tanks had three Lorraine tractors, for a total of 24 for each Mechanised Light Division. The AMR 35 or Panhard 178 units did not use the type, but trucks only, as its speed was considered insufficient. It was proposed to remedy this by fitting a stronger engine, bringing the speed to 50 km/h. The TRC 37L was also not present in the Cavalry Light Divisions. 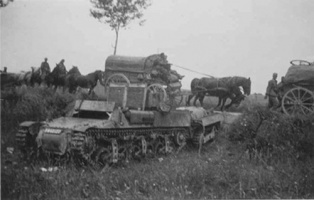 In practice the supply vehicles would mainly move by road and meet with the tanks at predetermined rendez-vous points. Refueling was relatively quick as the Vulcano could theoretically pump 565 liters in fifteen minutes. To completely refill a heavy tank would normally take about forty to sixty minutes. The trailer fuel reservoirs could themselves be replenished by the company fuel truck carrying 3600 litres of petrol. The company supplies could again be restocked from battalion stocks, moved by trucks loaded with fifty litre fuel drums. This method of distribution ensured a sufficient fuel supply on the tactical level, but was too cumbersome for strategic movements: if large distances had to be covered on track, the tanks would be directly refuelled from fuel trucks. When the Germans invaded on 10 May, French tank units had an organic strength of 606 Lorraine 37Ls; the numbers produced were thus insufficient to provide each unit with its official complement. About a third had to do without. That day French General Headquarters decided to increase the TRC 37L strength of 1e and 2e DCR with a half; these armored divisions had been earmarked as reserves against an expected German breakthrough attempt in the Gembloux Gap and the low range of the Char B1 bis worried French command. To free enough tractors, 3e DCR, still in the process of being constituted, had to give up its twelve TRC L37s to 1e DCR. 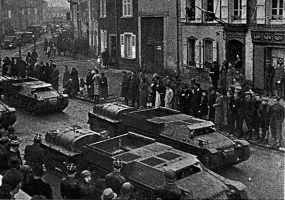 Ironically, the main German breakthrough would be atSedan and 3e DCR was sent to block it — and despite its larger number of fuel tractors, 1e DCR would still on 15 May be surprised by 7. Panzerdivision while refueling. During the campaign the crews of TRC 37Ls quickly saw the need for some armament and began to improvise machine-gun mounts on their vehicles. The first development from the TRC 37L was an armoured personnel carrier, the Voiture blindée de chasseurs portés 38L ("Armoured mounted infantry vehicle 38L"). 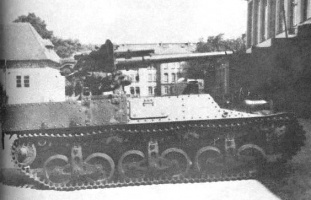 Like the TRC 37L, this Lorraine 38L was equipped with an armored tracked trailer. The total capacity was twelve men: the driver and one passenger in the driving compartment, four in the former cargo bay, and six in the trailer. To protect the infantry squad, high box-like armored superstructures were built over both the bin and the trailer, with doors at their back. 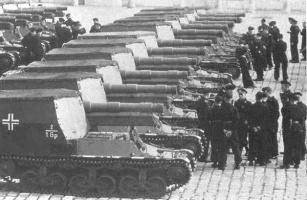 A total of 240 VBCP 38L vehicles were ordered, of which nine had been delivered on 1 September 1939 and around 150 by 25 June 1940. Of all participants in the Battle the Bataillon de Chasseurs Portés, the (single) mechanized infantry battalion within the Division Cuirassée, or armored division of the Infantry. On 10 May they had however not yet been allocated to these units, who still used half-tracks. An improved model, the VBCP 39L, was created by expanding the cargo bay to carry eight passengers. This model had no trailer and a total capacity of ten persons; extra room was found by raising the upper deck — the passenger compartment was open-topped — and constructing a more forward sloped armour glacis, contiguous with the nose section; the type thus resembled postwar APCs. Some two hundred VBCP 39L vehicles were ordered, but none had been delivered by June 1940. Experimental and limited production models included tank destroyers armed with 47 mm SA 47 guns (Chasseur de Chars Lorraine) and command post vehicles.